You’re In! Now share the love below & get this sweet FREE gift! Welcome to the Fit Marriage community! You’ll be receiving your first action-packed newsletter in your inbox momentarily, so keep an eye out for it. Reveal 10 awesome fat-burning workouts that you can do in TEN MINUTES with no equipment! Present exactly how to do each power-packed exercise in HD VIDEO! Give you the tools you need to share a fun, fast & effective workout WITH YOUR SPOUSE OR KIDS! You are one of the smart folks who see the value in making fitness a part of your healthy marriage. And it’s our mission to spread this message and the tools to get there far and wide. So, let’s work together to help your friends and make you look really cool in process, shall we? Simply let your friends know that Fit Marriage is here for them using the nifty tools below (Facebook, Twitter or good ole email are fine). 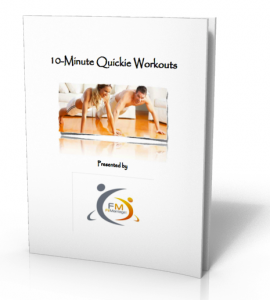 It will take you less than a minute, and to say THANKS we’ll give you instant access to an awesome e-book full of incredibly effective 10-minute interval workouts! Go ahead & choose your favorite way to share below & get your FREE workouts!